Enjoy spaghetti as a versatile food that goes with a variety of sauces and toppings. Prepare spaghetti simply by tossing it with garlic and olive oil, or create a more elaborate dish with tomato sauce, Parmesan cheese and fresh garden vegetables. Add lean meat and serve spaghetti with a side salad for a complete meal, or serve it as a side dish at a family gathering. Purchase whole-grain spaghetti to get the most nutrients and fiber. Spaghetti is a type of pasta made from flour and water and formed into solid strings. Flour is a source of carbohydrates, the preferred fuel supply your metabolism uses for energy. Registered dietitian Joan Salge Blake writes in "Nutrition and You" that you need 45 to 65 percent of your daily caloric intake from carbohydrates. Though some fad diets claim that eating just protein and fat is healthful, no-carb diets may deprive you of essential nutrients from plant sources of food, such as carbohydrates from spaghetti. Spaghetti is a dietary source of vitamins, minerals and fiber -- especially if you purchase whole grain or whole-wheat pasta. One 1/2 cup serving of whole-wheat pasta has 90 calories but contains 2 grams of fiber as well as calcium and iron. Whole grains also contain higher levels of nutrients selenium, potassium and magnesium. Selenium helps regulate thyroid hormones and functions as an antioxidant. Potassium plays a role in fluid balance and helps maintain pH. Magnesium supports metabolism, healthy muscles, nerves, bones and the heart. Spaghetti -- especially whole-grain spaghetti -- is a source of fiber. Fiber plays several important roles in health including blood sugar regulation, digestion and immunity. Fiber slows the uptake of sugars, helping you keep balanced blood-sugar levels. Dietary fiber also absorbs water and adds bulk to your stools, promoting regularity. High fiber intake supports beneficial bacteria in your digestive tract that help your immune system fight infections. Fiber also makes you feel full from meals, allowing you to eat less and maintain a healthy weight. 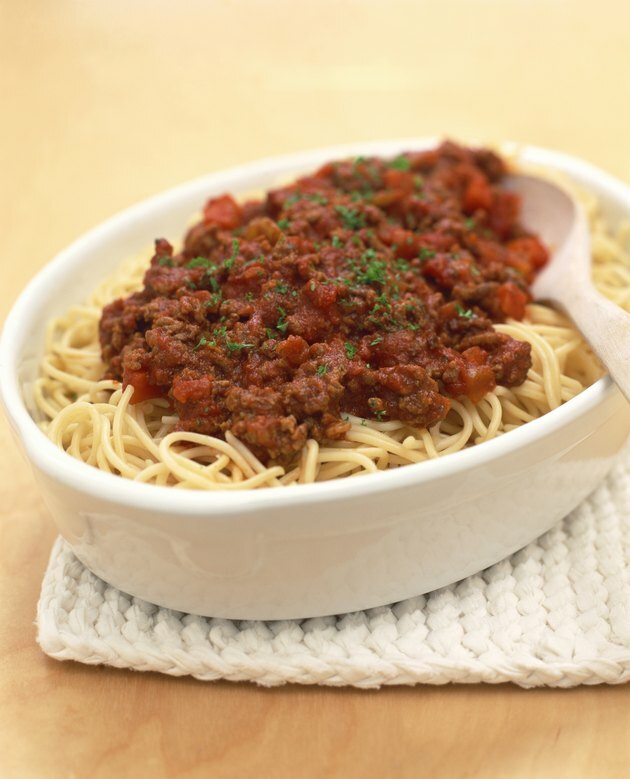 Spaghetti sauce adds nutrients to your diet and may help prevent cancer. A 1/2 cup serving of spaghetti sauce provides vitamin A, vitamin C, calcium and iron while serving as a source of the antioxidant lycopene. In a study published in the "Journal of the National Cancer Institute" in 2001, men with prostate cancer who ate tomato-sauce pasta dishes reduced oxidative DNA damage to prostate cells. Researchers concluded that lycopene from tomato sauce may provide a future cancer treatment.